The Sandy River is one of Oregon's best kept fly fishing secrets. This beautiful river is unique in that it offers year-round runs of fresh steelhead, both winter and summer fish. We fish the Lower Sandy River in our Cataraft, which enables us to fish all of the productive canyon water effectively. The Sandy River, due to water levels in the lower portion, is fished from November to early June. 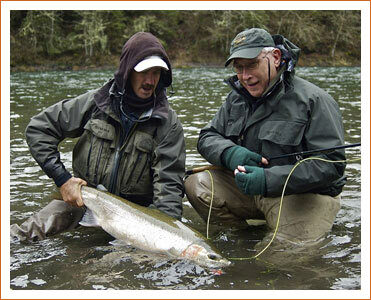 Our Sandy River Steelhead average from 7-11 lbs, with opportunities for fish in the 20's. Because of the size and casting room dictated by the river's bank, we think the Sandy River is best fished using two-handed fly rods. The Sandy River - Truly a World Class Steelhead Experience.